We have covered basics in last few chapters, like Generic Views, template languages, ORM, interaction with django admin etc. Now in this chapter we will be creating Custom User, who will be able to access the Qusetion and answers in the Quora like app. We have checked Quora for checking many qusetions in our past. Qusetions may be both technical or non technical. In this tutorial we will be creating a Qura like application but not exactly the Quora. We will be creating a project from scratch, lets brush-up !!! Step 2): In your settings.py file add a line just after ALLOWED_HOSTS = . AUTH_USER_MODEL = 'core.User' // It can be kept anywhere in the file but good to keep just after Allowed hosts. Don’t forget to add your newly created app to installed apps in settings.py file. Congratulations you have customised your Django user Model. now lets migrate changes. Now that we are aware of Class Based View let’s implement user registration using the same. We will now use the above forms in our views, add the below code to core/views.py. There are few thing which we have imported like login(), make_password() etc, it will be good to know about them. To log a user in, from a view, use login(). It takes an HttpRequest object and a User object. 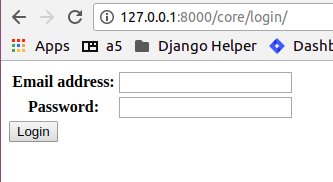 login() saves the user’s ID in the session, using Django’s session framework. make_password creates a hashed password in the format used by this application. It takes one mandatory argument: the password in plain-text. we will talk about dashboard-view further in this tutorial. For now just relate it like, once you register yourself you will be redirected to the dashbord-view. Its still not over we still have to make some modifications in settings.py , urls.py and adding of templates. If you have followed previous chapters you may try on your own. Still you can refer to content below. Add below code to core/urls.py and quora/urls.py respectively. Now we will add a new directory to our project as project/templates in our case quora/templates. And inside templates directory add a new file templates/register.html and add the below code. What next? Take some time and think what will be the next thing to do. And come back to te chapter. Yes, you are right , after registering the user we will redirect him to his dashboard and also create a way by which he/she could login and logout from the application. And the code for this can be found below. We have also configured two more templates i.e., templates/login.html and templates/dashboard.html with minimal functionality. Wait, are we missing something ? Yes, till now we haven’t discussed about the adding Questions and Answers in the Quora app, which is the foundation for the application. Create an app in django let’s name it as questans and add the below code to its models. Now in questans/models.py lets add the below code. In Question models we have created a slug field to make it more readable. We have also given flexibility for the user to save its answer anonymously. QuestionGroup is kept to differentiate question of different topics. Now our MVP of quora application is ready. We will discuss about Django’s Testing Framework. Run tests using the below command.